During 2012 the MQ-8B should get armament in the shape of the APKWS guided rocket, and probably a radar for maritime search also. Northrop Grumman’s MQ-8 Fire Scout rotary-wing unmanned air vehicle is gearing up for a new at-sea deployment in January, sailing aboard the frigate USS Simpson as it moves closer to U.S. Navy operational evaluation next Spring. For the Fire Scout, 2011 has been an eventful year, including combat deployments to two theaters, a combat loss and the Navy’s first unmanned flight using biofuel, undertaken in late September with a JP-5/camelena-based fuel mix. In August the frigate USS Halyburton completed a seven-month deployment during which it had embarked two MQ-8B Fire Scouts for operations alongside manned Sikorsky MH-60 Seahawks. During the cruise, the Fire Scouts of HSL-42 Det 2 undertook numerous missions, including anti-piracy duties and classified payload trials. The Halyburton cruise greatly matured the MQ-8 system, leading to the type’s deployment from the vessel during Operation Unified Protector over Libya. The Fire Scouts performed regular ISR/targeting missions, during which one of the aircraft was shot down on June 21 by pro-Ghaddafi forces. Details of the event have not been released, but it has been officially confirmed as a combat loss rather than an operational one. 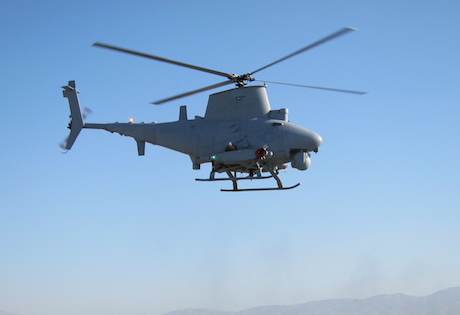 In May, three MQ-8Bs were deployed to northern Afghanistan to provide ISR coverage, specifically around 300 hours of full-motion video (FMV) surveillance per month. After six months in which the system proved itself to be a valuable force-multiplier, Northrop Grumman received a follow-on $18.65 million contract from Naval Air Systems Command in late September to maintain the detachment for a further year. Deployment to Afghanistan validated the Fire Scout’s capabilities while operating in an overland role. This has been of great value as Northrop Grumman strives to explain to potential customers the advantages of rotary-wing UAVs for ISR tasks as opposed to fixed-wing. The MQ-8’s ability to use unprepared landing zones and reduced manpower requirements are key attributes. The Fire Scout is being offered to a number of countries, and opportunities exist in the Middle East, including the United Arab Emirates. Around a year ago, the MQ-8 was demonstrated here, while also undergoing trials of hot-temperature modifications. In terms of ongoing development, Northrop Grumman received a $17 million contract on September 23 to weaponize the MQ-8B with the BAE Systems APKWS laser-guided rocket. This program is a Navy special-interest item for rapid deployment within 18 months. Test firing is likely to commence in mid-2012, leading to delivery by March 2013. The MQ-8C has been developed to meet an urgent operational need from U.S. Special Operations Command, with an anticipated total of 28 air vehicles. It had been expected that all future procurement would switch to the larger platform, but the Navy is “not clear on its requirements yet,” said Fuqua, and may still require the smaller MQ-8B for the Littoral Combat Ship program.